Laurent Fabius, French foreign minister and president of negotiations by member states of the UN climate change convention to take place in Paris in December 2015. Christiana Figueres, UN Framework Convention on Climate Change (UNFCCC) Executive Secretary on 27 June 2013 at a meeting in Istanbul, Turkey. “As the years go by and the world’s nations put off cutting emissions, the odds of staying below 2°C look vanishingly unlikely. Catch a glimpse of the ‘2 Degrees’ movie. The film is an exploration of the moral issue of our age – a documentary about climate justice and community action. It’s Australian made, and captures the backstory of the community campaign in Port Augusta which recently made the news with the announcement by Alinta Energy that they have committed to conducting a full feasibility study into a 50MW stand alone solar thermal power station with storage. The film premiers in Sydney on 20 August 2014. • A new 312-pages report from the US Federal Energy Information Administration predicts CO2-emissions will increase 46 percent in the next 25 years. To see what might happen to the Earth if it was ever caught in the grip of runaway global warming, it is only necessary to look next door: Venus, our closest neighbour in space, is believed to have experienced a runaway greenhouse effect in the past. Shrouded in a dense carbon dioxide atmosphere, it has an average surface temperature of around 460°C – hot enough to melt lead. • Every year, the Arctic is losing around 78,000 square kilometres of sea ice – an area larger than the Republic of Ireland. And as we lose the sea ice and heat up the ocean, more permafrost is encouraged to melt, releasing methane and creating a vicious circle of warming. The Antarctic peninsula has warmed by 3°C in summer and 5°C in winter in the last 60 years. • And: “Stand by for extreme weather. Prepare for heat waves on a scale that was once unprecedented. For once, there is no ‘if’ in the forecast. Even if governments abandon fossil fuels everywhere, immediately and invest only in green energy, there will be new record temperatures. The greenhouse gas emissions of the last few decades now mean that regions of the planet subjected to extreme heat will double by 2020 and quadruple by 2040,” wrote Tim Radford in Climate News Network on 15 August 2013. • The price tag for climate-related extreme weather reached 188 billion US dollars just in 2011 and 2012. And the work by Michael Mann suggests that the most likely probability given current policy responses is that the earth will reach +2ºC by about 2036 – ie. about 20 years from now. Because +2ºC is too hot, Mann’s work indicates that we have less than 20 years to cut the world’s emissions to zero and to start drawing the excess CO2 out of the air. From the 1850s onwards, man has pumped large amounts of carbon dioxide from coal, oil and gas into the atmosphere. Compared to 0.028 percent previously, the CO2 level today stands at 0.040 percent. Every day, we release 90 million tonnes of global warming pollution into the atmosphere. As a rule of thumb, global temperatures rise by about 1.5°C for each trillion tonnes of carbon put into the atmosphere. The world has pumped out half a trillion tonnes of carbon since 1750, and temperatures have risen by 0.8°C since the beginning of the last century. It has risen by twofold in Denmark. During the same period, the average annual amount of rain has increased by nearly 20 percent – from 640 to 765 mm – in Denmark, while solar radiation in Spain has increased by 2.3 percent every decade since the 1980s. At current emission rates, the next half-trillion tonnes of carbon will be emitted by 2045; the one after that before 2080. “We conclude that the widely accepted target of limiting human-made global climate warming to 2 degrees Celsius (3.6 degrees Fahrenheit) above the preindustrial level is too high and would subject young people, future generations and nature to irreparable harm. “With CO2 stabilized at 400–450 ppm (as required for the frequently quoted “acceptable warming” of 2°C), we infer a likely long-term sea-level rise of more than nine meters above the present. Therefore, our results imply that to avoid significantly elevated sea level in the long term, atmospheric CO2 should be reduced to levels similar to those of preindustrial times,” a paper in PNAS concludes. PNAS — Proceedings of the National Academy of Sciences of the United States of America — is one of the world’s most-cited multidisciplinary scientific serials. In March 2013, a headline of scienceblogs.com sounded: An Inevitable Headline in 2014: “Planet’s CO2 level reaches 400 ppm for first time in human existence.”. But as it turned out, already two months later, the first report of levels of 400 ppm ticked in. One of the world’s leading campaigners for carbon cutting took the name 350.org because scientists had told us we must reduce the amount of CO2 in the atmosphere from its current level to below 350 ppm in order to preserve our planet. Climate scientists have discovered “a self-reinforcing effect” whereby increased CO2 in the air increases the frequency of the most extreme kinds of weather, which in turn puts more CO2 in the air. “How will poets memorialize us? How will we be remembered if, like the British light cavalry charging a well-prepared Russian artillery battery in the Crimean War in 1854, we don’t reason why, we just keep on our current path even though it is self-evidently suicidal. Concentrations of the greenhouse gas carbon dioxide in the global atmosphere are approaching 400 parts per million (ppm) for the first time in human history. The website keelingcurve.ucsd.edu provides daily updates, analysis, and information on the state of climate. The only good news about the Earth’s record greenhouse-gas levels is that they have been well measured. Numbers as clear as Keeling’s are a rarity. What Does 400 ppm Look Like? Recent estimates suggest CO2 levels reached as much as 415 parts per million (ppm) during the Pliocene. With that came global average temperatures that eventually reached 3 or 4 degrees C (5.4-7.2 degrees F) higher than today’s and as much as 10 degrees C (18 degrees F) warmer at the poles. Sea level ranged between five and 40 meters (16 to 131 feet) higher than today. The UN’s climate chief called for urgency Monday as she opened a new round of global talks amid warnings that Earth-warming carbon dioxide levels were approaching a symbolic threshold never seen in human history. The Four Reports of the Climate Apocalypse? This graph cuts right to the bone of the problem: the recent global warming is happening a lot faster than any other warming in the past 11,300 years. From an article in Science by Shaun Marcott, Jeremy Shakun, Peter Clark, and Alan Mix, on 8 March 2013. A report from the World Bank, ‘Turn Down the Heat: why a 4°C warmer world must be avoided’ in November 2012, calculated that the measures suggested to tackle climate change are unlikely to keep temperature rise below three degrees. The report concluded that if the current mitigation pledges are not fully implemented, warming of 4°C could occur as early as the 2060s. A report entitled ‘Peak Planet’ was published in March 2013 by London-based HSBC — a banking and financial services company, which is the sixth largest public company in the world. Pricewaterhouse Coopers, the world’s largest professional services firm, published a report saying “We have passed a critical threshold”, the US National Climate Assessment, the International Energy Agency, MIT… they have all recently published reports that warn of catastrophic consequences of carbon emissions. “The option to avoid 2°C degrees of global warming — our goal for more than 10 years — is out of reach: we have emitted too many greenhouse gases and are on a much warmer trajectory. In 2000, we had many choices regarding global warming, but instead of reducing emissions in various ways, we elected to accelerate. Global greenhouse gas emissions have increased in all but one year since 2000, and those compounding emissions increases have dramatically diminished our choices. One study simply states that each degree the global temperature rises will result in two meters of sea level rise. Tens of millions — some say hundreds of millions — of people will be displaced by drought and rising seas and must look for a new home. In particular in the poorest countries on the planet. More than 32 million people fled their homes in 2012 because of disasters such as floods, storms and earthquakes – 98% of displacement related to climate change. The video above is a recommendable recording of a guest-sermon by American author and activist Bill McKibben — about climate change — which he held in a church in New York in April 2013. Regardless of which religion you belong to, watch it. If you are in a hurry, the first 5:30 minutes can be skipped or fast-forwarded through. According to Bill McKibben and his organisation 350.org, fossil fuel corporations currently have in their reserves five times the amount of carbon that, if burned too quickly, may raise atmospheric temperatures to a catastrophic level where Hurricane Sandy-scale storms could become the norm. In 2011 The Met Office produced this interactive map showing potential changes in extreme temperatures and precipitations, highlighting the effects that could have on humans, crops and marine life. “Emissions have increased 54 per cent since 1990, putting the world on-track to be between 4 and 6 degrees hotter by 2100 unless action is taken,” said another report released in 2012 by a consortium of scientists calling themselves the Global Carbon Project. Assuming no CO2 further is added to the atmosphere right now, we still have 40 years of heating ahead of us before the climate reaches equilibrium. But what our world leaders are talking about now is not even to stop the emissions. They discuss how to reduce global CO2 emissions by some percentages — by 2030, 2050 or later. China is the world’s leading user and producer of coal. China burns more coal than America, Europe, and Japan combined. In 2009, China was reported to be building one new coal-fired power plant of 2 gigawatts each week. China’s coal problems is a global problem. The International Energy Agency said that global coal use — now close to 8 billion tons a year — could increase by 65 percent by 2035 if current energy trends continue. A recent independent analysis reported that 1,200 new coal-fired power plants are being proposed worldwide, three-quarters of them in India and China. Simon Anderson, the International Institute for Environment and Development in Edinburgh, United Kingdom. “By delaying emissions cuts, the world is simply deciding to pay more for them later,” he told New Scientist in November 2012. When researchers at Oregon State University and Harvard University published their findings on 8 March 2013 in the journal Science that the earth is hottest now, and getting hotter, the world’s biggest news agencies wired the story to newspapers around the world. On 21 March 2013, a new study of ocean warming was accepted for publishing in Geophysical Research Letters by Balmaseda, Trenberth, and Källén. Completely contrary to the popular contrarian myth, global warming has accelerated, with more overall global warming in the past 15 years than the prior 15 years. This is because about 90 percent of overall global warming goes into heating the oceans, and the oceans have been warming dramatically. The paper is also a significant step in resolving the ‘missing heat’ issue, and is a good illustration why arguments for somewhat lower climate sensitivity are fundamentally flawed if they fail to account for the warming of the oceans below 700 metres. We need to measure global warming by accounting for all changes in global heat content, including the deeper oceans. Otherwise we can easily fool ourselves into underestimating the danger of the climate problem we face. The amount of carbon dioxide in the atmosphere underwent one of its biggest single-year jumps ever in 2012, according to researchers at the National Oceanic Atmospheric Administration. Between the end of 2011 and the beginning of 2013, carbon dioxide levels increased by 2.67 parts per million — a rise topped only by the spike in 1998. Pieter Tans, who leads the greenhouse gas measurement team for the US National Oceanic and Atmospheric Administration (NOAA), said the major factor was an increase in fossil fuel use. “It’s just a testament to human influence being dominant. The prospects of keeping climate change below that [two-degree goal] are fading away,” he told the Associated Press. The perceived seriousness of climate change has fallen particularly sharply since the unsuccessful UN Climate Summit in Copenhagen in December 2009. Environmental concerns among citizens around the world have been falling since 2009 and have now reached twenty-year lows, according to a multi-country GlobeScan poll. The findings are drawn from the GlobeScan Radar annual tracking poll of citizens across 22 countries. A total of 22,812 people were interviewed face-to-face or by telephone during the second half of 2012. Twelve of these countries have been regularly polled on environmental issues since 1992. As mentioned above, when researchers at Oregon State University and Harvard University published their findings on 8 March 2013 in the journal Science that the earth is hottest now, and getting hotter, the world’s biggest news agencies wired the story to newspapers around the world, and what did the editors do? Did they give it priority and a headline on the front page? No. Of course not. As seen in this example from Herald Sun in Australia, they squeezed it in on the bottom of page 19. The editors of Herald Sun got their priorities right. A super-important non-news story about fitness gets the main headline, while the Earth and its future will have to do with a small note at the bottom – with a header of a kind which, considering its impact and consequences for us all, in a world of normal journalistic criteria would have been placed right on the front page. In short, if we have hopes to re-mobilise the public to take environmental issues serious, we are very much in need of new messages. “…If the press has, until very recently, largely failed us on the subject, the TV news is a disgrace. Despite the record temperatures of 2012, the intensifying storms, droughts, wildfires and other wild weather events, the disappearing Arctic ice cap, and the greatest meltdown of the Greenland ice shield in recorded history, their news divisions went dumb and mute. The Sunday talk shows, which supposedly offer long chews and not just sound bites — those high-minded talking-head episodes that set a lot of the agenda in Washington and for the attuned public — were otherwise occupied. The mounting financial troubles of journalism only tighten the muzzle on a somnolent watchdog. It’s unlikely that serious business coverage will be beefed up by media companies counting their pennies on their way down the slippery circulation slope. Why invest in scrutiny of government regulators when the cost is lower for celebrity-spotting and the circulation benefits so much greater? Meanwhile, the nation’s best daily environmental coverage takes a big hit. In January, the New York Times’s management decided to close down its environmental desk, scratching two environmental editor positions and reassigning five reporters. How could such a move not discourage young journalists from aiming to make careers on the environmental beat? Posted on YouTube.com on 30 October 2012. 16 percent: The number of Americans alarmed about climate change in 2012. UPDATE June 2013: The majority of Americans, or 63 per cent, now believe there is solid evidence that global warming is real, according to a poll from the National Surveys on Energy and Environment. Why is Reuters puzzled by global warming’s acceleration? James Lovelock, the first scientist to discover the presence of ozone-depleting chlorofluorocarbons in the atmosphere. 29 March 2010. In Australia, the summer of 2013 was the hottest in the country’s records. The US also had the hottest summer on record in 2012. “In summary, there is now an ongoing fundamental shift in the climate system,” the Australian Climate Commission’s latest report said. The report, entitled ‘The Angry Summer’, has been reviewed for accuracy by scientists from leading universities, the Bureau of Meteorology and the CSIRO, and endorsed by a range of emergency services and health groups, including the Australian Medical Association. “Nobody has more political muscle than the fossil fuel industry,” wrote Fred Pearce, a consultant on environmental issues, in his article in the magazine New Scientist on 26 January 2013. Is Obama about to blow his climate credentials? Lord Nicholas Stern, author of the government-commissioned review on climate change that became the reference work for politicians and green campaigners, now says — in an interview at the World Economic Forum in Davos — that he underestimated the risks, and should have been more ‘blunt’ about the threat posed to the economy by rising temperatures. “This is an animated visualization of the startling decline of Arctic Sea Ice, showing the minimum volume reached every September since 1979. It is clear that the Arctic will soon be ice-free for an increasing part of the year, with consequences for the climate. 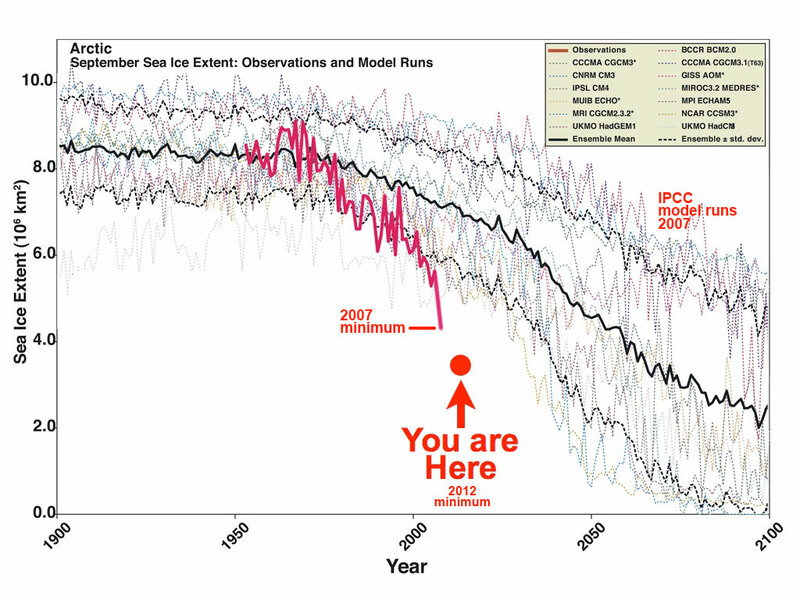 The rate of ice loss in the Arctic is staggering. Since 1979, the volume of Summer Arctic sea ice has declined by more than 80% and accelerating faster than scientists believed it would, or even could melt. » Produced by Andy Lee Robinson who published it on YouTube.com on 22 April 2013. The extent of the sea ice in the Arctic reached a new record low in September 2012. Climate change is melting the sea ice in the region at a rate much faster than estimated by earlier projections. The snow cover also shows a downward trend. The melting Arctic might impact not only the people living in the region, but also elsewhere in Europe and beyond. The EEA recently published a report on the impacts of, and vulnerability to, climate in Europe. The report includes many indicators on changes in the climate system and the cryosphere, indicators of impacts on the environment and society and indicators on changes in the Arctic cryosphere (Arctic sea ice and Greenland ice sheet). According the EEA report, climate change is affecting all regions in Europe, causing a wide range of impacts. Further impacts are expected for the future, potentially causing high damage costs. The report highlights the need for adaptation in all regions and sectors across Europe. “We have passed a critical threshold,” says a report from the world’s largest professional services firm, Pricewaterhouse Coopers. A reduction in carbon intensity of 5.1 percent per year is needed if we are to meet the target of limiting temperature rise to 2 degrees Celsius. However, last year, despite the economic slowdown, we saw a reduction of only 0.7 percent, which has been typical of every year since the turn of the century. A new study shows that we have to reduce emissions even more than scientists initially thought in order to avoid climate change’s worst impacts. A paper published in Energy Policy on 20 February 2013 by Michel den Elzen and colleagues examines new information on likely future emissions trajectories in developing countries. The report finds that developed countries must reduce their emissions by 50 percent below 1990 levels by 2020 if we are to have a medium chance of limiting warming to 2°C, thus preventing some of climate change’s worst impacts. In other words, the world may need to reduce its emissions even more significantly than previously thought. This level of reductions is considerably higher than what the scientific community thought was necessary to meet the 2°C goal. The bad news is that the way things are going currently we are far from even a 25 percent reduction in developed countries by 2020. And then hold that up against this article on Thinkprogress.org, which goes into depth with what is considered to be realistic CO2-reduction-targets in the next 20 years: 40×35: A Zero-Carbon Energy Target for the World’s Largest Economies. Tony deBrum, minister-in-assistance to the president of Marshall Islands. The 68,000 inhabitants of the low-lying coral atolls could become stateless as the islands are being lost to a rising Pacific Ocean. What follows is a list — arbitrary, to be sure, and far from all-inclusive — of some of the places that could disappear, or be radically changed, if climatologists are right in their predictions of global warming. Melting permafrost in the Arctic could push the Earth towards climate change that is “irreversible on human timescales”, according to a report released in November 2012. Permafrost is frozen soil, and currently occupies about 24 percent of the exposed land surface of the Northern Hemisphere. Permafrost typically contains organic matter; if the permafrost thaws, then the organic matter is expected to decay releasing carbon dioxide and methane. Thus thawing permafrost is a mechanism for runaway climate change: warming thaws permafrost, releasing carbon dioxide and methane, which causes further warming, which thaws more permafrost, which releases…… and so the process continues. We are “playing with fire” when we allow the temperatures on the planet to raise. The “permafrost bomb” is an example of the kind of unforeseen surprises global temperature raises could have waiting for us, because we allowed the planet’s weather-system to be disturbed. The conclusion of a group of scientists who looked into Siberian caves for evidence of what has happened to the Arctic permafrost over the past 500,000 years is that global temperatures just slightly warmer than today’s can be enough to thaw large amounts of permafrost, which will then release large amounts of carbon into the atmosphere – actually so much of it that it dwarfs even the current human emissions of CO2. As well as describing permafrost and the large potential for emissions as it thaws, the United Nations Environment Program’s report ‘Policy Implications of Warming Permafrost’ from 2012 tells us that permafrost thawing is being observed, but there is not much information available to tell us how fast it is currently thawing. Scientists found evidence that permafrost is thawing along continental shelves, undersea in the Arctic and, more recently, in the Antarctic. The scientists are concerned that greenhouse gases released from thawing permafrost could amplify global warming. The danger of permafrost thaw is a favourite subject for the media, and this occasion is no exception. But questions remain unanswered as to how much carbon may be released — and how fast. Barnaby, what would be your defense? “There can be no greater crime against humanity than the foreseeable, and methodical, destruction of conditions that make human life possible. The moral, and existential, implications of human-caused climate change should by now have triggered full-scale, World War II style effort to end fossil fuel dependence and associated greenhouse gas emissions.
. . . . . . . . . . . . . . . . . . . . . . . . . . . . . . . . . . . . . . . . . . . . . . . . . . . . . . . . . . . . . . . . . . . . . . . . . . . . . . . . . . . . . . . . . . . . . . . . . . . . . . . . . . . . . . . . . . . . . . . . . . . . . . . . . . . . . . . . . . . . . . . . . . . . . . . . . . . . . . . . . . . . . . . . .
How is it that rich and highly intelligent people – and in particular the CEOs of fossil fuel companies – do still not regard climate change as something that will upset their business models? ‘Them’ being the poorest of nations – the millions who live in countries like Bangladesh and Pakistan, in Africa, the Pacific Islands, and so on. “If you thought the global refugee crisis was bad today, just wait a few decades,” says Michael T. Klare, a professor of peace and world security studies at Hampshire College and the author, most recently of the book ‘The Race for What’s Left’. “A number of societies will simply disintegrate in the fashion of South Sudan today, producing staggering chaos and misery,” Klare says. He believes US president Trump, the federal US government and its partners in the fossil fuel industry will be ‘the true perpetrators of climate genocide’. Later in this century many of the worst-case climate-change scenarios – the inundation of coastal cities, the desertification of vast interior regions, and the collapse of rain-fed agriculture in many areas – will become everyday reality. “Think of the developments in Nigeria, Somalia, South Sudan and Yemen as previews of what far larger parts of our world could look like in another quarter-century or so: a world in which hundreds of millions of people are at risk of annihilation from disease or starvation, or are on the march or at sea, crossing borders, heading for the shantytowns of major cities, looking for refugee camps or other places where survival appears even minimally possible. …and the international response so far, essentially: a giant shrug of indifference. The CEOs and politicians who knowingly are responsible for this mess continue, as we saw Australia’s deputy prime minister do it on national tv last week, to defend building new coal mines and causing even more havoc than we are already lined up to. It’s sheer madness driven by delusional greed. The 1.5°C global warming target in the Paris Agreement could be breached in 10 years. There are some arguments over definitions, but it does show just how in the thick of problems we now are – and all because of incompetent and corrupt leadership in a democratic system that was hijacked by a careless fossil fuel industry which thinks making good money at the moment is more important than whether we all and future generations have a safe future. It really is time to hold the rogue climate villains accountable for this crime against humanity. Calling for a Terracide Tribunal, as Tom Engelhardt does – and a Climate Emergency Declaration, as the Australian Climate Emergency Declaration campaign does. The oil and gas company Santos admits its business plans are based on a climate change scenario of a 4°C rise in global temperatures. What form of climate denialism is this? Delusional greed? But… 4°C warming equals a catastrophe. “Not our problem!,” Santos executives seems to think. And of course, what happens in 50 years won’t be chairman Peter Coates’ problem at a personal level, because he is most likely dead and gone by then. But does he really have such disrespect for those who come after him? Apparently! Santos has admitted its business plans are based on a climate change scenario of a 4°C rise in global temperatures, disregarding that it is at odds with internationally agreed efforts. Santos chairman Peter Coates made the comments at Santos Annual General Meeting in Adelaide, telling shareholders it was “sensible” and “consistent with good value”. Experts call it ‘a breathtaking failure to come to grips with a world in transition’. How Fast Will Rising Temperatures Shrink CO2 Storage? Will Global Coal Boom Go Bust As Climate Concerns Increase? A new study from NOAA’s National Climatic Data Center confirms what climate scientists have long been saying about climate change’s effect on the hydrological cycle. The UK government’s chief scientist has said that there is already enough CO2 in the atmosphere for there to be more floods and droughts over the next 25 years. Bill McKibben, founder of 350.org, in NPR on 30 December 2012: 2013: A Tipping Year For Climate Change? It is increasingly unlikely that global warming will be kept below an increase of 2C (3.6F) above pre-industrial levels, a study suggests. The findings were published in the journal Nature Climate Change, the data in the journal Earth System Science Data Discussions. The actual observations of arctic sea ice melt are far outstripping the climate model predictions of just a few years ago, that the denial-sphere continues to call “alarmist. Click for larger version. Excerpt of a note on Facebook by Jeff Poole from Brisbane in Australia who has been working in the conservation movement for almost 20 years.